I went to an estate sale on Friday with lots of potential. This estate sale company shows oodles of photos on their site when they are having an upcoming sale and I spotted quite a few things that caught my eye. I like to go through the photos and pick out possible purchases and then study the photo to see what room those items might be in. It’s sort of like a game. Then when I get to the house I know what rooms to look at first. There’s nothing worse than seeing someone walking out of a bedroom with the exact item you had your heart set on, because you had been dilly dallying around in the kitchen. What I couldn’t tell from the photos is how small, dark and cramped this house would be. And that’s an understatement. Add in the additional estate sale tables and lots of people, it was a jam packed house. Most of the items I had seen online appeared to be in the basement, so I headed there first. Let’s talk basement steps for a second. When you see an over-abundance of “Please Watch Your Step” and “We Are Not Responsible For Accidents” signs at the top of the steps, you should probably take that seriously. The steps to the basement were old, rickety, pulling away from the wall and at a cattywampus angle. It was taking your life into your own hands to make it down them in one piece. Me, still nursing a sprained ankle, probably should have skipped the basement, but I took the chance and went on down. After all, there were finds to be found down there!!! 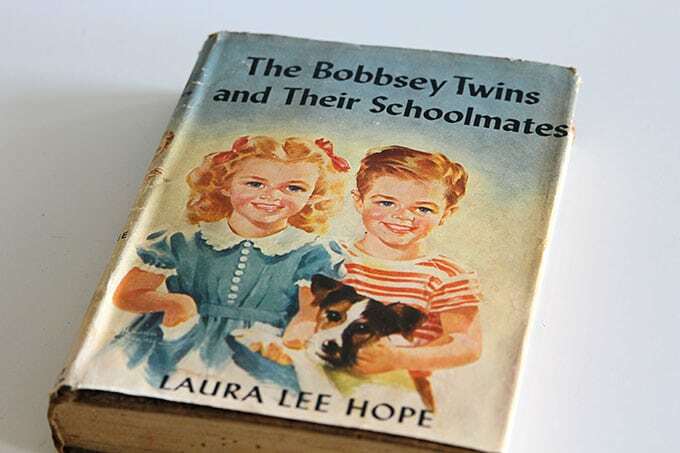 I found some Bobbsey Twins books stuffed into an old cardboard box in the basement. There were probably ten of them in the box, but they were in REALLY poor condition. Covered in that thick, dark, old dust that only a basement seems to have, covers ripped and spots on the pages (mold???). I just grabbed the best one and called it a day with the books. Who stores books in a basement anyhow? 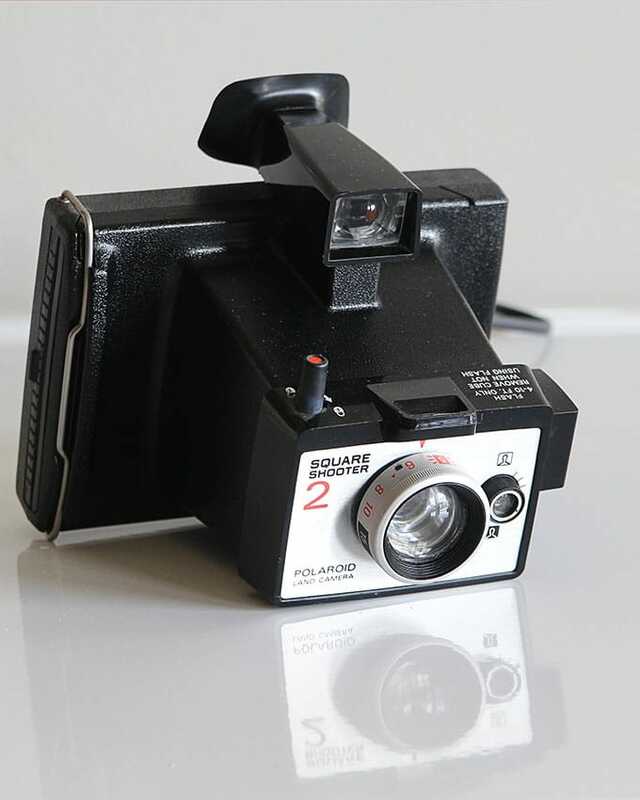 I also found a Polaroid Land Camera (manufactured 1972-75) in the basement of doom. This photo was taken after having given it a bath. It was covered in a thick layer of dust and grime when I found it. I have no idea if I can still buy film for this, but I thought it would be a nice addition to my camera addiction. My last dirty find in the basement was this milk glass vase. I’ve been on a milk glass roll lately and have been picking it up at thrift stores or wherever I find it. And it normally cleans up just fine. Unfortunately, most of the other things I had spied in the online photos were gone by the time I got there. As they say, the early bird gets the Pyrex. I didn’t find the letters at the estate sale, but I did find them at a cheapola out of the way antique mall who always has good prices. It’s in a small town far away from the big city, so their prices tend to be totally out of line (in a good way) with the Columbus prices. 50 cents a letter. They would go for probably $2.50 a letter here. 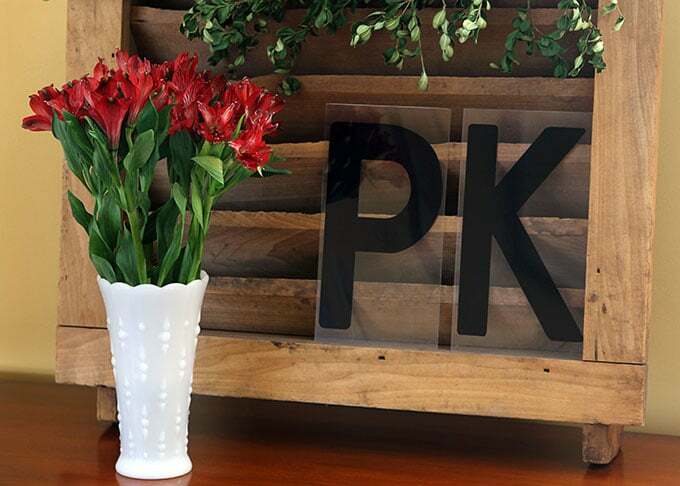 I picked up the P and K for my initials. I had originally wanted to spell my name, P-A-M, but couldn’t for the life of me find an A. And since it’s so close to Valentine’s Day, I picked up the X’s and O’s. I also found an ampersand and a dollar sign, but forgot to take photos of those for you. Has there been any estate sale action in your life lately? Any dirty basements in your past? like a great way to spend a day! Shara from Monkeybox showed her X’s and O’s on Instagram the other day too! It’s a “thing” right now! I went to a tag sale last Saturday – thought for sure the items I was most interested in would be gone. But they weren’t. Disturbing trend in tag sales in the Columbus area – vendors are pricing items a lot closer to retail than they were a year ago. Unless there is something that I really and truly want, I won’t go on the first day of the sales anymore and will wait until the second day for the discounts. Anyway – because the items I wanted were still there, I got them for 50% off so that was cool. 1950’s paper Halloween decorations and a 1970’s checkerboard tv dinner tray. I’m like you though I usually have specific items I want and once I determine they are mine or not there, that’s when I walk through the rest of the home. Oh yeah – last week I picked up two hard cover Nancy Drew books too. Yes!!! What is with the prices around here!!! And I hate when they set up a special table with “antiques” on it and then mark everything on it real high. Some of it is the better stuff, but most isn’t. Although I always thouht it would be fun to WORK at an estate sale company and get to sort all that stuff out! It’s a wooden air vent from an old barn. They’re normally at the peak of the roof. I bought it at a big yard sale out in the country a few years ago and then it sat in my office until I finally drug it out one day and put it in my dining room. There’s a better photo of it in my fall centerpiece post https://www.houseofhawthornes.com/inexpensive-fall-centerpiece/ . Love the big letters! Especially since P and K are my initials as well. 🙂 My mom is a pro at digging through those dark basements for treasures. I tend to just pick around at the top items and let her do the burrowing. I was wondering about your ankle. For about a year I wore one of those ace ankle wrap, the ones you just slip on. It helped so much. From time to time that ankle will swell or feel weak so I wear it for a couple of days. The last doll auction I went to had such dirty stuff. It messes with my allergies. There is one tomorrow but I am not feeling well so may not go. I know I say that every time and then still go. Have you been to the Finders Keepers Mall in Heath. Come someday and we can meet. Where is the place that you go for good prices? Stay well. I hope that Max is doing well. The cheapo place is all the way down in Logan at the Logan Antique Mall. I only make the trip about twice a year, but I always find some good stuff. Yes, we’ll have to meet for the Finders Keepers Mall! That sounds like fun. Oh, no! Better than a dead rat, but still! Nice little set of finds! Estate Sales and Auctions are slim pickins this time of year. Oh how I am itching for a good sale – Estate, Rummage – a box on the curb, ANYHING. I wouldn’t even mind the dirt and grime. I will say that I am terrified of basement steps – particularly the ones the don’t have a back on the step. I just know there is a monster going to grab my heels. Luckily, (depending on how you look at it) we don’t have basements in Arkansas, so no worries with monsters here. I scored a huge box of those Marquee letters at a sale once for $2.00 (for hundreds of them!). I sold a ton and now I am down to a bunch of punctuation marks and odd letters. I wish I had the brains to have kept an entire set of letters. I did keep JUNK and doubles of all the numbers for birthdays and holidays. So, I’m not a total dork. The one I was talking about is the Logan Antique Mall in Logan, Ohio. It’s right off of Rt 33 SE of Columbus. Love your finds, especially the letters. Here in Raleigh NC the prices on the first day of estate sales is really a bit crazy. I went to one on the first morning, stood in line in the rain because I SO needed a soda crate. I bought 3 but I really should have only gotten one. They were really more than I should have paid. Oh well, now I’m over my craving for soda crates. Sounds interesting, but I have so much crap that I need to have an Estate sale now before i kick the bucket LOL. My son said at Christmas I can have a dumpster here next week so you can start throwing away all those damned dishes that you have all over the house and those magazines. Guys just don’t understand, but if they were bike, tools or golf clubs, then they would. Nice finds….I am dying to go digging!!! Have not had the chance in a while. 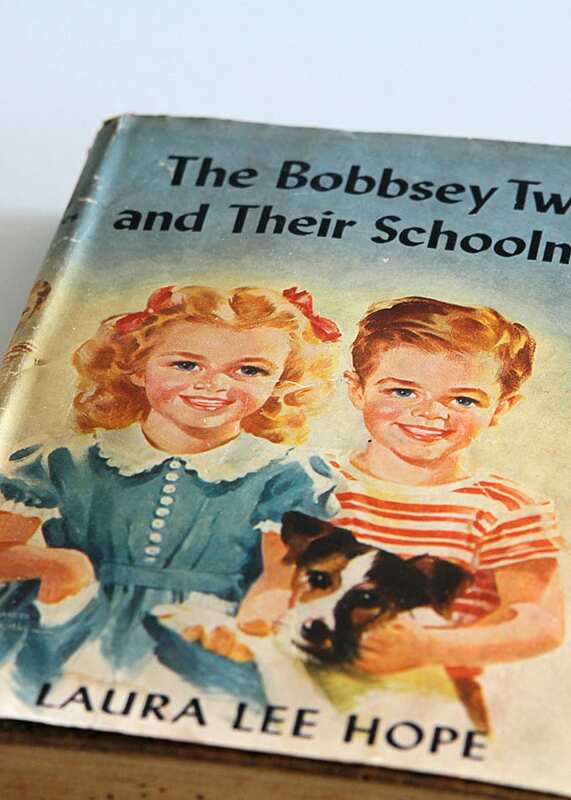 In my hoarder’s closets I have my old Nancy Drew hard covered books, my Bobbsy Twins series and a polaroid camera that I bought my husband (in the case) along with lots of milk glass that I have collected over the years! Time to get them out and put away or sell other stuff! TY for all your wonderful suggestions. I’ve had very little estate sale action. Always happy to live through someone else. Glad to see the camera addiction is still going strong. The estate sales are just starting up for the season here. Unfortunately, I haven’t seen any worth my time yet. But the flea market is in full swing and I never miss it! So glad you made it up and down the stairs safely! Nothing happening around here yet. Trying to stay well has been my goal. We don’t have too many estate sales here and most go the Auction route instead. I do love Estate Sales though but find in my area that most of the stuff is a lot of times priced at Retail prices. I prefer Estate sales simply because there is so much less time invested than an auction but I do get some pretty good deals at Auctions too. My son lives in Northeast Kansas so when I go visit him I can sometimes hit the estate sales there. I am a lover of “rust and dust” so I tend to plan my route hitting the kitchen really quickly in search of any pyrex and then hit the garage and/or basement next to find my treasures. . .
and yes Stairs are SCARY! I was just at a three day estate sale (here in Nebraska!) over the weekend, but not “professionally done.” The family was doing the pricing, which can sometimes be disastrous, but for the most part I felt things were priced well–if they were too high, I probably didn’t want it anyway. The most I paid for anything was 10 dollars for a large box of silverware–I mean a BUNCH!! Everything was dirty but the house and two garages were jam-packed. I’m pretty sure the family had been there since the 60s. I went each day and managed to find treasures (to my thinking, anyway) and I didn’t even spend 30 dollars all told. As for decorating trends…please, please, please tell me the value of fake animal skulls/antlers on the wall anywhere. I could possibly see the merit of real mounts if my husband hunted, which he doesn’t, but the papier mache things or whatever they are just make me laugh a little. Maybe even snicker. Possibly guffaw. I have a real deer head in my living room. It’s only there because my husband really really wanted it when we were cleaning up my mom’s house and I sillily assumed he wanted it for his garage. Nope, he hung it up in the living room, over the steps going down to the basement, so unless I grow two more feet taller I can’t reach it 🙂 That estate sale sounds AMAZING!! !